CLEVELAND, Ohio – The first 2,000 days of life is the most formative for the development of a child. Monday evening a panel of experts will discuss what Northeast Ohio has learned the last 365 or so days about those 2,000 days and what action the region needs to take to better foster development. Here’s a look at the panel. Akram Boutros is the CEO of The MetroHealth System, the public hospital system most focused on care for the poor. Boutros assumed his post in June 2013. He has more than 20 years of leadership experience in large community hospitals, specialty hospitals and academic medical centers. Sharon Sobol Jordan is chief of staff for Cuyahoga County Executive Armond Budish. She previously was president and CEO at The Centers for Families and Children, one of the oldest and largest nonprofit organizations in Northeast Ohio. Under her leadership the organization served 20,000 people each year through 18 different locations across Greater Cleveland. Eric Gordon is the CEO of the Cleveland Metropolitan School District. He took the job in June 2011 after serving as the district’s chief academic officer for four years. As CEO, he is responsible for the leadership and daily management of Cleveland’s 39,000-student school district. Thea Wilson is the vice president for children and families at the Council for Economic Opportunities in Greater Cleveland. Wilson is responsible for managing the operations of Early Head Start, Head Start and Parental Involvement programs. Wilson has nearly 40 years of early childhood development experience in a public school system and spent 11 years in administration. 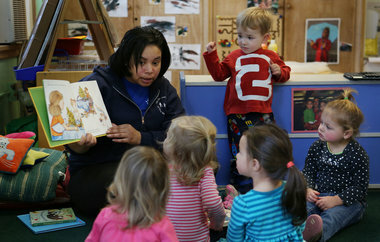 For a year, cleveland.com, 90.3 WCPN, WVIZ/PBS ideastream, and The Plain Dealer have explored the science, best practices and economics of early childhood education as part of Cleveland Connects: The First 2,000 Days, sponsored by PNC Bank. Together the partners have produced dozens of stories for online, print and broadcast on topics including measuring pre-school quality, the costs associated with running quality pre-K programs, the importance of good nutrition for kids, the dangers of lead paint and the benefits of breastfeeding. That effort also has included a pair of panels broadcast on WCPN and WVIZ by ideastream. What are the top assets and challenges affecting children who are 5 years old or younger? What has been done over the last year to address those challenges? Looking ahead, what requires more attention and effort and on what targets should the region focus? Addressing child development in the first 2,000 days is a complex challenge, from health and social development, to fitness and good nutrition to who ultimately foots the bill. But a panel on Monday said that the costs, and the community’s efforts, are worth the investment. Bill Isler, CEO of The Fred Rogers Company and a longtime professional educator and advocate for children, presented the keynote address at the first forum in the 2,000 days series. Isler will deliver a special message to the panel for Monday’s forum.